Reeds are what put the “go” in sax. The wood that is attached to the mouthpiece will help determine the quality of sound, response, and resonance produced by the horn. A PLAYER IS ONLY AS GOOD AS HIS LUMBER WILL ALLOW HIM TO BE! Preference of reeds is up to the individual player. Reeds are such a big element in the woodwind world that entire books have been written on the topic. I could never hope to offer that kind of information here. But I will, however, provide a basic background, list accessories, and some techniques to help extend the life of your reeds. Apart from wood and plastic or synthetic, there are two kinds of lumber: Single cut and double cut. The single cut receives a “single” swipe of the machine during the planing process. Conversely, the double cut gets two cuts from the plane. The single cut has a vamp, or heart, that resembles a thumb nail. The double cut has an “edge” that goes straight across the back. Generally, double cut reeds are more consistent in their outcome. Single cut can sometimes come out lop-sided, which cause them to be out of balance. Consider this picture of a poorly produced single cut reed. 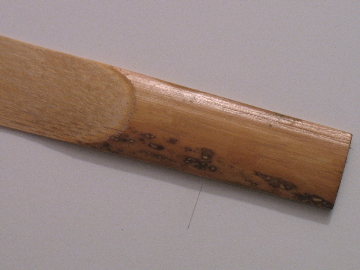 The spots often seen on the back of the cane are of no consequence to its performance. Interestingly, they are the result of leaves from the cane plant causing uneven exposure of the sun during growing. Warping of the tip, particularly just after soaking, is no big deal. Simply press the area just behind the tip against the table of the mouthpiece (or any hard, flat surface) for a minute and it will flatten out. You can then attach it to the mouthpiece. Warping in the length, however, is a serious problem that makes trying to save it a waste of effort. On the other hand, prevention of warping is a good investment of effort and a little bit of money. Storage devices are designed to do just that. In addition to some type of storage device, the sax player should have one or more tools. Ever wonder why a new reed is rough on your lower lip the first few times you play on it? If you polish it first, you will forego the discomfort. 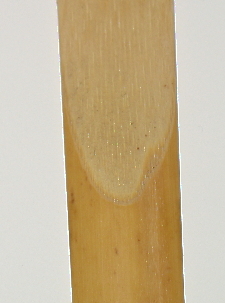 If you played on a reed for a long time it could develop mold. Throw it away? No! It can be saved!